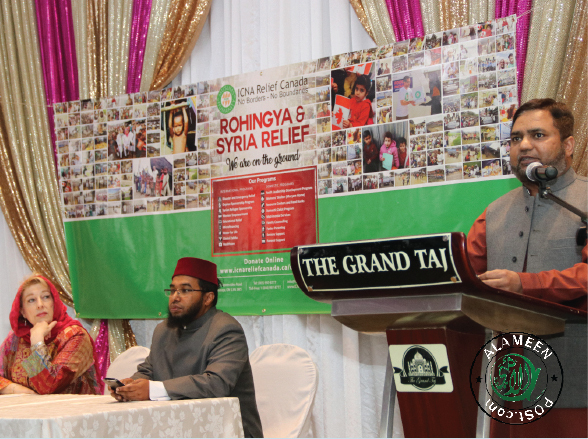 ICNA Relief Canada (IRC) organized Fundraising Iftar & dinner to raise funds for the international and domestic relief programs particularly Rohingya and Syria Relief. The august event was held at the Grand Taj Banquet Hall in Surrey on May 20, 2018. Sr. Yvonne Ridley and Imam Tariq were keynote speakers at the event. The formal proceedings of the program started with a beautiful recitation, by Br Farooq Azam Khan, of the holy verses of Surah Al-Baqara (2:261-274) from the divine book, Holy Qur’an followed by a heart touching nasheed “Allah is Calling you”, prepared by female children volunteers led by Misbah Memon. Towards the end, the youngest volunteer, Furqan Memon’s call for prayer moved the participants who were already feeling the aura of holiness and compassion ensuing from the speeches of the guest speakers. Around three hundred and twenty concerned community members, brothers and sisters, attended the ICNA Relief Surrey’s fundraiser and showed their concern, care and commitment to help their brothers and sisters in need across the globe by their donations and prayers. 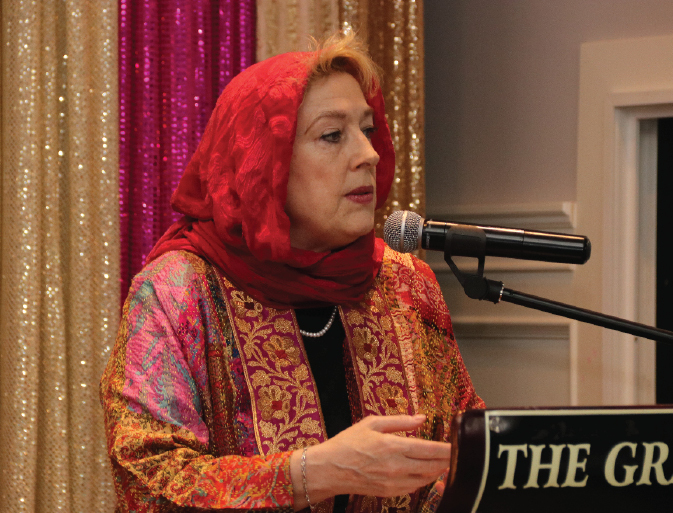 Renowned British journalist and author, Sister Yvonne Ridley while addressing the participants shared some highlights about her conversion to Islam and what caused it. She referred to her book ‘From Captive to Convert’ and also apprised that her new book about the life of the Prophet PBUH is also underway. Later, she talked about the plight and suffering of the Muslims in Syria, Rohingya and Palestine and shared the stories she witnessed while visiting the victims in the Rohingya camps. She urged the participants to earn the pleasure of Allah swt in the holy month of Ramadan Kareem and generously donate to help the brothers and sisters in need. She admired ICNA Relief Canada who was extending the much needed support to the suffering communities across the globe. After two video presentations reflecting the devastating plight that badly hit Rohingya and Syrian Muslim communities, guest speaker Imam Tarek highlighted the importance of helping these brothers and sisters in need. He quoted that we should put ourselves in the shoes of those brothers and sisters who are going through hardship to get the feeling and motivation to help them. He urged the participants to show compassion and empathy, instead of mere sympathy. He also emphasized the Orphan Sponsorship program and said that by spending $600 per annum, or $50 per month you can take care of an orphan. Imam Tarek explains that Prophet Muhammad PBUH said that whosoever will take care of an orphan will be with me in the paradise, like two fingers are together. He further added that helping these brothers and sisters is actually helping our selves in the hereafter, inshaAllah, as this will please Allah swt who promises to multiply the rewards of good deeds in Ramadan Kareem. While you’ll get the tax-deductible receipts from ICNA Relief here, the real rewards and blessings Allah swt will bestow upon you in this holy month of Ramadan Kareem will be innumerable and matchless. Earlier, Br. Ghulam Mustafa Sajid, pioneer of the ICNA Relief Canada Resource Center/ Food Bank in Surrey BC, briefed about the domestic and international programs of ICNA Relief Canada and the services it is rendering in 22 countries since 1997 to serve the cause of humanity. Ghulam Mustafa Sajid presented ICNA Relief Canada annual report 2017 and briefed about the relief activities domestically and internationally taken up the ICNA Relief Surrey Resource Centre / Food Bank and urged the participants to join hands for the noble cause to serve humanity and support these initiatives which involve local community. ICNA Relief’s vision is to build an exemplary Muslim community focused on achieving personal excellence and contributing to the moral, social, and economic development of Canadian society. ICNA Relief Canada works to empower people in need, both locally and globally particularly at a time when many communities like Syrians and Rohingya Muslims are facing unprecedented social, political, and economic challenges. In 2017, ICNA Relief Canada served more people and communities than ever before spending an amount of $7 million in relief and humanitarian efforts in more than 22 countries. These projects ranged from building water wells in drought-stricken areas of Somalia, Kenya, Kashmir, India, and Pakistan to the construction and operational funding of educational institutions and healthcare projects in Syria, Pakistan, India, Bangladesh, and Kenya. It also worked on emergency and disaster relief projects in Nepal, Burma, and Palestine to provide fresh zabiha meat to parts of Myanmar as well as over one million Rohingya refugees living in Bangladesh. ICNA Relief has also sponsored 3,237 orphans across the globe spending approximately $1.0 million per year. Through its ten food banks, it provided $1.9 million worth of food supplies to 57000 Canadians to ease their suffering. ICNA Relief also established and operated local Canadian projects including but not limited to family counselling, seniors’ support, funeral support, free matrimonial services, and Syrian Refugee Sponsorship (SRS). ICNA has also introduced newly launched youth centre in Mississauga, and Youth Leadership Development Program (YLDP) across Canada. These are only a few examples of the numerous ways in which ICNA Relief Canada endeavours to alleviate human suffering and empower people and communities. These efforts would not have been possible without the generous and consistent support of donors. ICNA Relief worked tirelessly to further improve project monitoring and audit processes ensuring accountability, transparency, and efficiency of donations spent. For this purpose, ICNA is using social media presence to ensure that donors and the public receives regular updates about how and where ICNA Relief Canada spends their donations. As part of accountability, key feature of ICNA Relief is keeping management expenses to the minimum level compared with other similar organizations. During 2017, management expenses were only 3.77% of total expenses while fundraising expenses were only 4.0 %. More than 92.23% of donations were directly spent on programs and deserving people. International disbursements include expenses on disaster and emergency, educational relief, water for life, orphan sponsorship, zabiha, and micro financing. As a part of accountability and to keep donors updated about operations and expenses, ICNA Relief Canada’s several years’ annual reports are publicly available and can be accessed online: https://icnareliefcanada.ca/progress-reports. ICNA Relief Canada Surrey Chapter wants to thank all brothers and sisters who attended the event and those who had intention but couldn’t attend for any reason. We have raised about $30,000 in the event on spot and donations are still pouring in, lots of brothers and sisters who could not come to the event and wanted to donate have called after the event. Donation for any of these causes can be made online at icnareliefcanad.ca/donate OR by calling the ICNA Relief Canada Resource Center/Food Bank Surrey BC at +1 (778) 578-3080, OR can write to surreyfb@icnareliefcanada.ca. We are also thank all the volunteers for their efforts. May Allah swt give you all the best of reward….aameen.